DINOSAURS were known as shape-shifters. 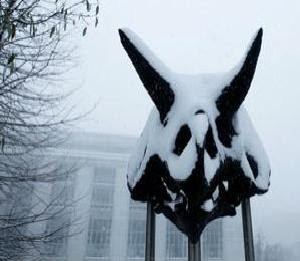 Their skulls undergo intense changes during their lives, growing larger, sprouting horns then reabsorbing them, and changing shape so completely that different stages look to us like different species. This discovery comes from a study of the iconic dinosaur triceratops and its close relative torosaurus. Their skulls are obviously different but are essentially from the very same species, said by John Scannella and Jack Horner at the Museum of the Rockies in Bozeman, Montana. Triceratops had three facial horns and a short, thick neck-frill with a saw-toothed edge. Torvosaurus also had three horns, however at different angles, and a much longer, thinner, smooth-edged frill with two huge holes in it. So it's not startling that Othniel Marsh, who discovered both considered them to be separate species, in the late 1800s. Now Scannella and Horner say that triceratops is only the childish form of torvosaurus. As the animal matured, its horns changed shape and orientation and its frill became longer, thinner and less jagged. Finally it became fenestrated, producing the classic torvosaurus form. This excessive shape-shifting was potential because the bone tissue in the frill and horns stayed undeveloped, spongy and riddled with blood vessels, not at all fully hardening into solid bone as happens in most animals during early maturity. The only modern animal known to do anything similar is the cassowary, descended from the dinosaurs, which develops a large spongy crest when its skull is about 80 per cent fully grown. Shape-shifting sustained throughout these dinosaurs' lives, Scannella says. "Even in the most mature specimens that we've examined, there is evidence that the skull was still undergoing dramatic changes at the time of death."